Spring seems to be a little earlier than usual this year, and insect life is starting to be noticeable again. Helen uses buckets of water in her yarn hand-dyed yarn processes, and the other day, she found a bumblebee in the bucket. It was still alive, so she put it on a rock to dry off, and brought it a little honey to help it regain its strength. It worked at the honey for some time, so Helen decided to take some pictures. Helen loves close-up photography and looking at the small things in the world, and often tweets her pictures of lichens or other easily-missed things which turn out to be colourful and interesting when viewed close up. 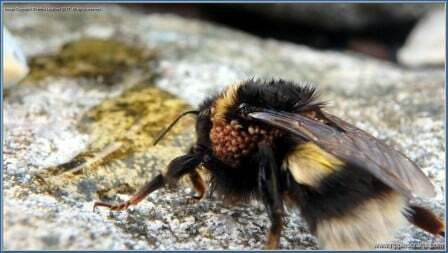 But when she looked at the pictures on the screen, something unexpected and apparently rather gruesome showed up – the poor bee was covered on one side in fearsome looking mites. 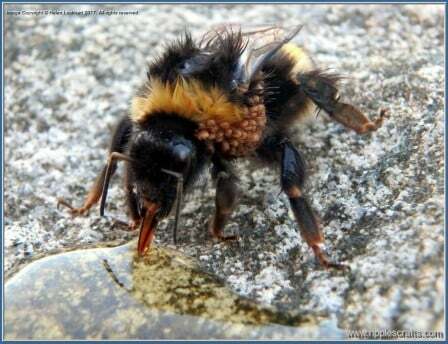 I posted details to the local Assynt Interpretation group, and our countryside ranger, Andy Summers, forwarded the email to the bumblebee conservation society for their information. It turns out that, at this time of the year, all bumblebees seen are queens, All other bumblebees died off in the autumn of last year, leaving just the queens to hibernate in readiness for the next season. 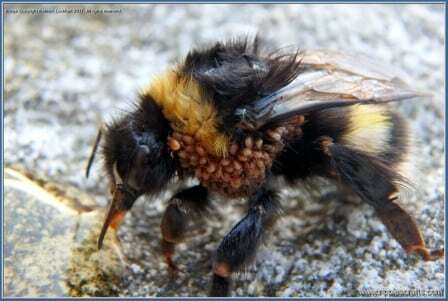 They are, therefore, critical to a flourishing bumble bee population for the coming season. Katy Malone, of the bumblebee conservation group, said, in reply to Andy’s email: “That’s a lot of mites! Poor girl! They aren’t feeding on her, though, they are just hitching a lift. When she finds a next site, they’ll drop off and start feeding on nest detritus.” Well that’s a relief, as they look like enormous ticks, in relation to her body size. Another little glimpse at the world of which we are apart, but from which we so frequently seem to want to remove ourselves.